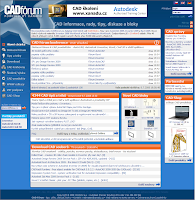 We have redesigned our popular CAD portal CADforum.cz. This free web service, serving for more than 11 years now, brings information, tips, discussions and CAD blocks for download to CAD professionals from all over the world. Try yourself the now look and updated contents of CADforum.cz. full list of AutoCAD commands and system variables in the main European localizations.